How to find freedom from fear: Buddhist teachings that really work, from a respected contemporary teacher. Fear is something that's such a part of our lives that it doesn't seem it would be possible to live without it. This book disputes that claim in a powerful way. 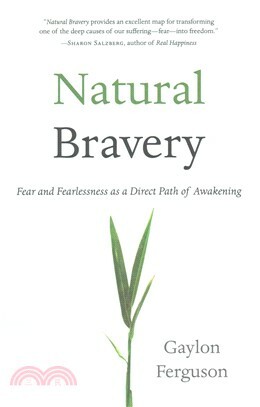 Gaylon Ferguson presents traditional Buddhist teachings to show that the fear that so often wreaks havoc on us is in fact quite insubtantial—and it's mostly something we create ourselves. If we can learn to see that, it becomes pretty simple to un-create it, and we also discover that there's a natural fearlessness in us that goes far deeper than fear. With this natural bravery as our foundation, we can live our own lives more effectively and also be a better help and comfort to others. GAYLON FERGUSON is a faculty member in the religious studies and interdisciplinary studies departments at Naropa University in Boulder, Colorado. He is an acharya, or senior teacher, in the Shambhala International Buddhist community. After studying meditation and Buddhist philosophy with Tibetan master Chogyam Trungpa in the 1970s and '80s, Ferguson became a Fulbright Fellow to Nigeria and completed a doctoral degree in cultural anthropology at Stanford University. After several years of teaching cultural anthropology at the University of Washington, he became teacher-in-residence at Karme Choling Buddhist Retreat Center until 2005, when he joined the faculty of Naropa University.